Neurotransmitters are chemical messengers produced by the nervous systems of higher organisms in order to relay a nerve impulse from one cell to another cell. The two cells may be nerve cells, also called neurons, or one of the cells may be a different type, such as a muscle or gland cell. A chemical messenger is necessary for rapid communication between cells if there are small gaps of 20 to 50 nanometers (7.874 × 10 −7 –19.69 ×10 −7 inches), called synapses or synaptic clefts, between the two cells. The two cells are referred to as either presynaptic or postsynaptic. The term "presynaptic" refers to the neuron that produces and releases the neurotransmitter, whereas "postsynaptic" refers to the cell that receives this chemical message. Neurotransmitters include small molecules with amine functional groups such as acetylcholine , certain amino acids, amino acid derivatives, and peptides. Through a series of chemical reactions, the amino acid tyrosine is converted into the catecholamine neurotransmitters dopamine and norepinephrine or into the hormone epinephrine. Other neurotransmitters that are amino acid derivatives include γ -aminobutyric acid, made from glutamate, and serotonin, made from the amino acid tryptophan. Neurotransmitters are formed in a presynaptic neuron and stored in small membrane-bound sacks, called vesicles , inside this neuron. When this neuron is activated, these intracellular vesicles fuse with the cell membrane and release their contents into the synapse, a process called exocytosis. Once the neurotransmitter is in the synapse, several events may occur. It may (1) diffuse across the synapse and bind to a receptor on the postsynaptic membrane, (2) diffuse back to the presynaptic neuron and bind to a presynaptic receptor causing modulation of neurotransmitter release, (3) be chemically altered by an enzyme in the synapse, or (4) be transported into a nearby cell. For the chemical message to be passed to another cell, however, the neurotransmitter must bind to its protein receptor on the postsynaptic side. 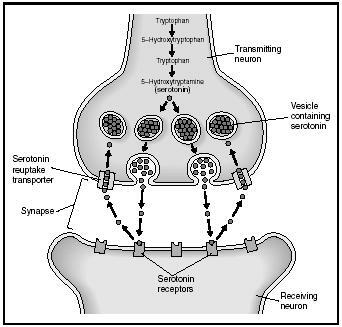 The binding of a neurotransmitter to its receptor is a key event in the action of all neurotransmitters. Some neurotransmitters are referred to as fast-acting since their cellular effects occur milliseconds after the neurotransmitter binds to its receptor. These neurotransmitters exert direct control of ion channels by inducing a conformational change in the receptor, creating a passage through which ions can flow. These receptors are often called ligand -gated ion channels since the channel opens only when the ligand is bound correctly. When the channel opens, it allows for ions to pass through from their side of highest concentration to their side of lowest concentration. The net result is depolarization if there is a net influx of positively charged ions or hyperpolarization if there is a net inward movement of negatively charged ions. Depolarization results in a continuation of the nerve impulse, whereas hyperpolarization makes it less likely that the nerve impulse will continue to be transmitted. The first ligand-gated ion channel whose structure and mechanism were studied in detail was the nicotinic acetylcholine receptor of the neuromuscular junction. This receptor contains five protein subunits, each of which spans the membrane four times. When two acetylcholine molecules bind to this receptor, a channel opens, resulting in sodium and potassium ions being transported at a rate of 10 7 per second. Acetylcholine's action at these receptors is said to be excitatory due to the resulting depolarization. Other receptors for fast transmitters have a similar amino acid sequence and are believed to have a similar protein structure. Glycine and γ -aminobutyric acid (GABA) also act on ligand-gated ion channels and are fast-acting. However, they cause a net influx of chloride ions, resulting in hyperpolarization; thus, their action is inhibitory . Slower-acting neurotransmitters act by binding to proteins that are sometimes called G-protein-coupled receptors (GPCRs). These receptors do not form ion channels upon activation and have a very different architecture than the ion channels. However, the timescale for activation is often relatively fast, on the order of seconds. The slightly longer time frame than that for fast-acting neurotransmitters is necessary due to additional molecular interactions that must occur for the postsynaptic cell to become depolarized or hyperpolarized. The protein structure of a GPCR is one protein subunit folded so that it transverses the membrane seven times. These receptors are referred to as G-coupled protein receptors because they function through an interaction with a GTP -binding protein, called G-protein for short. The conformational change produced when a neurotransmitter binds to a GPCR causes the G-protein to become activated. Once it becomes activated, the protein subunits dissociate and diffuse along the intracellular membrane surface to open or close an ion channel or to activate or inhibit an enzyme that will, in turn, produce a molecule called a second messenger. Second messengers include cyclic AMP , cyclic GMP , and calcium ions and phosphatidyl inositol. They serve to activate enzymes known as protein kinases. Protein kinases in turn act to phosphorylate a variety of proteins within a cell, possibly including ion channels. Protein phosphorylation is a common mechanism used within a cell to activate or inhibit the function of various proteins. For proper control of neuronal signaling, there must be a means of terminating the nerve impulse. In all cases, once the neurotransmitter dissociates from the receptor, the signal ends. For a few neurotransmitters, there are enzymes in the synapse that serve to chemically alter the neurotransmitter, making it nonfunctional. For instance, the enzyme acetylcholinesterase hydrolyzes acetylcholine. Other neurotransmitters, such as catecholamines and glutamate, undergo a process called reuptake. In this process, the neurotransmitter is removed from the synapse via a transporter protein. These proteins are located in presynaptic neurons or other nearby cells. The actions of neurotransmitters are important for many different physiological effects. Many drugs of abuse either mimic neurotransmitters or otherwise alter the function of the nervous system. Barbiturates act as depressants with effects similar to those of anesthetics. They seem to act mainly by enhancing the activity of the neurotransmitter GABA, an inhibitory neurotransmitter. In other words, when barbiturates bind to a GABA receptor, the inhibitory effect of GABA is greater than before. Opiates such as heroin bind to a particular type of opiate receptor, resulting in effects similar to those of naturally occurring endorphins. Amphetamines can displace catecholamines from synaptic vesicles and block reuptake of catecholamines in the synapse, prolonging the action of catecholamine neurotransmitters. SEE ALSO Acetylcholine ; Dopamine ; Hydrolysis ; Ion Channels ; Norepinephrine . Changeux, Jean-Pierre (1993). "Chemical Signaling in the Brain." Scientific American 269(5):58. Garrett, Reginald H., and Grisham, Charles M. (1995). "Excitable Membranes, Neurotransmission, and Sensory Systems." In Molecular Aspects of Cell Biology. Philadelphia: Saunders. Powledge, Tabitha M. (2002). "Beating Abuse." Scientific American 286(1):20. "Hallucinogens." Available from http://www.pharmcentral.com . "Narcotics." Available from http://www.pharmcentral.com . "Neurotransmitters." Available from http://www.pharmcentral.com . "Sedatives." Available from http://www.pharmcentral.com . "Stimulants." Available from http://www.pharmcentral.com .